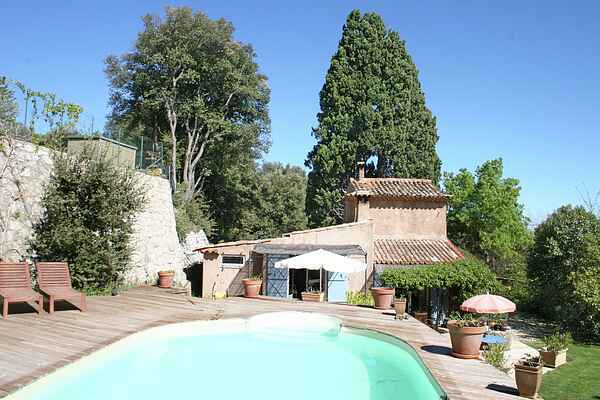 This typical Provençal holiday home with a large enclosed garden (1,760 m²), is situated on the edge of the village of Régusse (2 km), where you can get all your daily groceries. Within a half-hour drive you'll find the magnificent Gorges de Verdon and the Lac de Ste. Croix (30 km). Here you can go canoeing, rafting, swimming (beaches) and have long walks, but most of all you can enjoy the impressive gorges and the bright blue water. Return to your holiday home for a siesta on a sunbed at the edge of your private swimming pool (6 sunbeds provided). Children will have a great time in the swimming pool and they can play table tennis to their hearts' content. Later on, you can enjoy a nice aperitif on your covered terrace. It's a wonderful place to celebrate your holiday and an ideal starting point for nice day trips. Start your day with a café au lait in the charming little village town of Moissac-Bellevue ( 1.5 km). As the name suggests, here you have a magnificent view at a height of 600 m! Followed by a stroll and some browsing at the attractive Wednesday market in truffle town Aups (7 km). If it gets too warm in the afternoon, you can cool down in the 16th century caves of Villecroze (15 km).